Habit at Pukalani, Maui, Hawaii (USA). March 02, 2007. Origin and Habitat: Round Island, Mauritius (the Mascarenes) in the Indian Ocean. Habitat: This species grows in the lowland savannah on fertile volcanic soils among exposed rock. It is endangered in habitat and almost went extinct with fewer than 10 mature trees remaining in the wild because of the lack of regeneration due to the impact of introduced goats and rabbit. However it is very well established in cultivation for its unique beauty throughout the tropics and subtropics as a specimen plant. 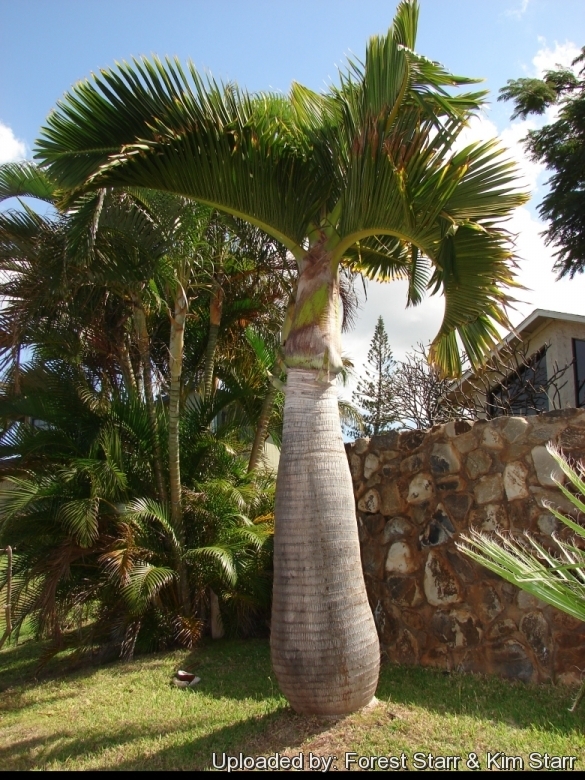 Description: Hyophorbe lagenicaulis is a little dwarf to medium sized palm with distinctive bottle shaped trunk (hence the common name). It will grow slowly to a height of 3-5 (or more) metres. The amazing swollen trunk is the eye catcher on this palm, but it also has other interesting characteristics that come and go as the palm matures from a seedling to a mature specimen. It is a slow grower that can take years to reach its mature height. Trunk: Massive stumpy fat-bellied, smooth, grey, with noticeable ring scars, widest at the base, tapering upwards to the neck of the bottle formed by the crownshaft, and up to 60 cm in diameter. The trunk is rounded upright and regular, in young specimens and will grow to be elongated and grotesquely distorted as the palm matures. Very young bottle palms often have the trunk covered by persistent leaf bases. It is commonly thought that the swollen trunk is for the purpose of water storage but Hyophorbe lagenicaulis is not a succulent plan, it is a myth that the trunk is a means by which the palm stores water. Crown: Small, sparse, with only 4 to 6(-8) fronds open at any time. Crownshaft: Smooth that connects the leaves to the trunk. Palm's juvenile period, the crownshaft and leaf petioles are red to orange colour changing to the normal greyish green colour as it matures. Leaves: Finely pinnate, upwardly arching, 2,5-3,5 m long in mature specimens. 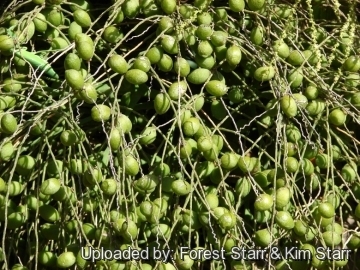 Leaflets, stiff, smooth, about 60 cm long and arranged in two upward pointing rows. Petiole small, 15-20 cm long. Inflorescences: Rise from under the crown at the point where the crownshaft meets the trunk. They grow upward as they mature supporting numeroustiny, cream-coloured flowers on the same stalk. Flowers are monoecious, male and female flowers on the same inflorescence. Fruit: 2,5 cm round green turning orange to black as they mature. 1) Page, W. 1998. Hyophorbe lagenicaulis. The IUCN Red List of Threatened Species. Version 2014.2. <www.iucnredlist.org>. Downloaded on 30 August 2014. 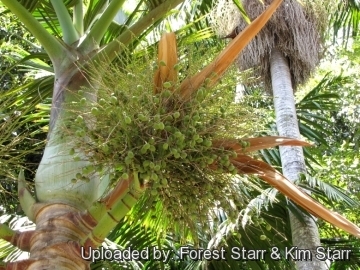 2) Forest & Kim Starr Hyophorbe lagenicaulis (bottle palm). Plants of Hawaii. <http://www.starrenvironmental.com>. Downloaded on 21 August 2014. 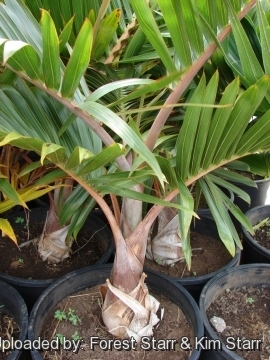 Cultivation and Propagation: This is an excellent easy to grow palm adapt to tropical and subtropical climates. 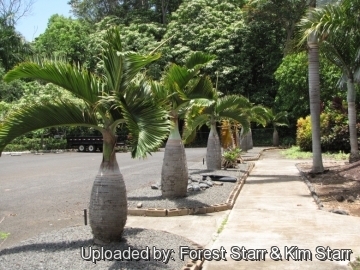 It unique unique shape and sculptural form together with its small canopy, slow growth and small stature make it suitable for a smaller landscape, or as a large interior potted plant. Soil requirements: It has a fibrous root system and benefits from deep organic, soils that are fertile, but thrives on wide range of tropical soils, like coastal marine alluvial clays, soils of volcanic origin, sands as long as they are well drained. Watering: It prefers adequate moisture to look its best. 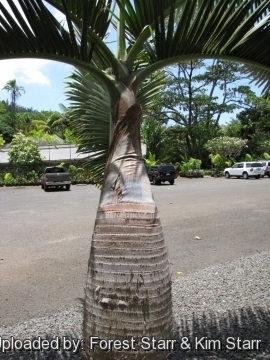 This palm a will tolerate occasional dryness if not prolonged. Don't let sit in water. Indoor, potted palms should not be over-watered. 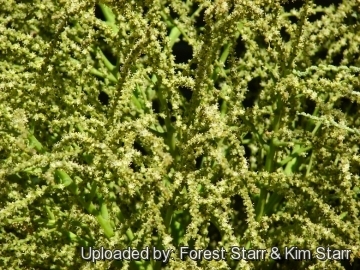 They may contract the fungus Phytophthora, if over-watered. Light: Prefers broken shade. It can take full sun as it matures if provided adequate water during dry periods. If home-grown, give some sun as with most tropical palms. Aerosol salt tolerance: It is very salt tolerant, but does a lot better inland then it does on the coast. 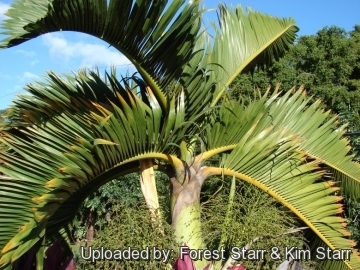 Hardiness: This palm is tender and is suited for tropical or subtropical climates, it is killed at 0°C or colder for any appreciable length of time, but may survive very light frosts (if very short) even if it end up getting nearly defoliated each winter. (USDA Zones 10-11) Any temps below 4° C degrees call for protection for this palm. Seedling growth arrestes below 15°C. Its cousin, spindle palm (Hyophorbe vershaffeltii), is hardier and can handle some frost and temperatures to about -3° C for short periods. Propagation: The fresh seeds take 4-6 months to germinate. If not properly treated, the seed does not have long shelf life. 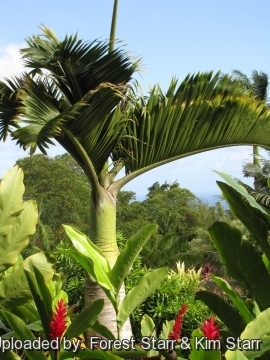 Garden uses: It is an excellent landscaping palm when set out on the lawn as a specimen, especially for small gardens where other palms will grow out of scale. Plant bottle palms in containers and feature it in a prominent spot on the patio. Mass plantings are common at median strips and roundabouts in tropical towns.